The Duchess of Albany has Wonderful tulip shaped bright Pink flowers with a darker bar. It is an aggressive grower so give her plenty of room. Humming birds and bees love the bell shaped blooms of the texensis group. 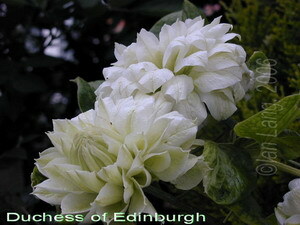 Grow Princess Diana, Gravetye Beauty and Duchess of Albany all together for a beautiful display. All three are on my web site. An outstanding old timer with White Double blooms early in the season as well as off and on during the summer.Flowers remaining for a long time. Sometimes flowers form a greenish tint. 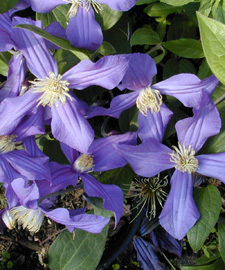 A Lovely good performing clematis in any garden. 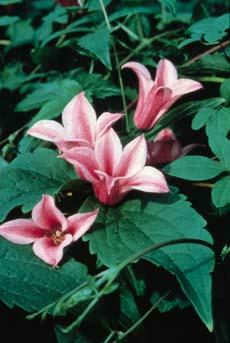 It is Beautiful, easy to grow and blooms till it freezes. Medium to large nodding Indigo Blue flowers fading to pale blue. Creamy yellow anthers. Long blooming and very striking in any garden. Outstanding as a ground cover too. RHS award of garden merit.